Examples, solution, videos, worksheets, games and activities to help Geometry students learn how to find the area of sectors. A sector is part of a circle bound by the central angle and its intercepted arc. You can think of it as the area of a "slice of pizza". What is the formula for the area of sector? The following diagram gives the formula for the area of sector. Scroll down the page for more examples and solutions. 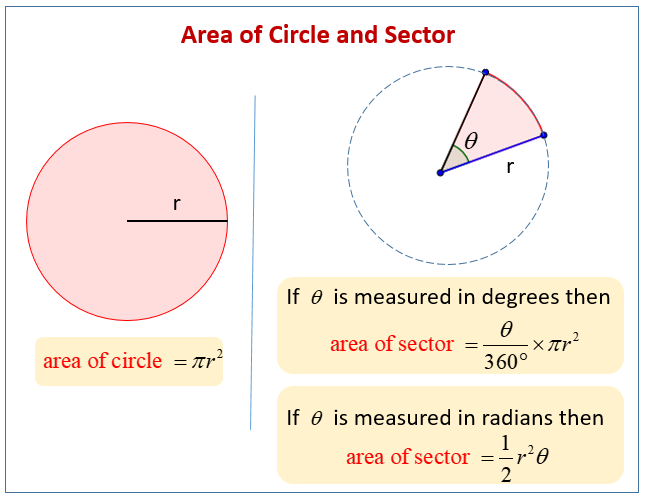 A sector in a circle is the region bound by two radii and the circle. Since it is a fractional part of the circle, the area of any sector is found by multiplying the area of the circle, π×r2, by the fraction x/360, where x is the measure of the central angle formed by the two radii. This video shows two examples, one for finding the sector of a circle and the other to find the radius of a circle with a given sector area. This video explains how to find the area of a sector.